Alright guys, as you know about my artwork, I do two things. But I enjoy doodling stuff, so I do it anyways, and I fail anyways. But practice makes perfect, so hopefully doing almost nothing will at least make me semi-competent, which is the goal here. Sometimes, though, I open up a new page in Flash and get stuck on what to draw. An idea simply refuses to come to mind. When I'm drawing without a purpose, drawing for the sake of drawing, my mind draws a blank. So if you want to see some stuff botched in my horribly simplistic stylings and don't mind me screwing with you based upon the wording of your suggestion, then come on down. The higher the odds of me failing miserably, the better! It's really just practice for me. Don't limit yourself to one thing at a time either. And feel free to throw in spore stuff or things you actually WANT an image of too, just be sure to provide reference links, since I'm not familiar with any of the stuff that goes on over on that side of the boards. To finish off this post, I'm gonna share some doodles when I was trying out doing everything with the hairline style... I don't recommend it. Ah well. And for the love of God guys, don't preach to me about practice tips or drawing books or whatever. I've used a lot of those resources before and I've picked up from them all I ever will. I simply can't learn that way. Just make me draw stuff. I call it failing, but I also call it progress. Hm... how about that kid in my avatar? 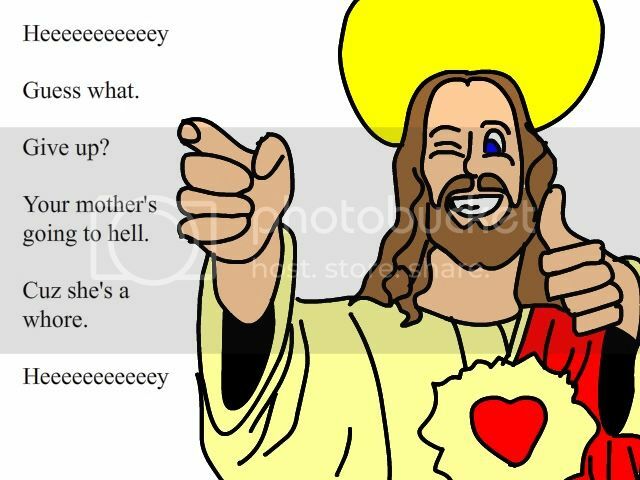 Shouldn't this be in the Merry Doodles and Sketches thread? This was a good chance for me to test shading with my hairline. I think I'm better off filling the space with color and then using a darker shade for the hairline's ink, or just straight black. It's tough because my tablet isn't responding to strokes that are too quick, or rather flash isn't accepting them, but either way it makes crosshatching nigh to impossible, and it's always my technique of choice on paper. 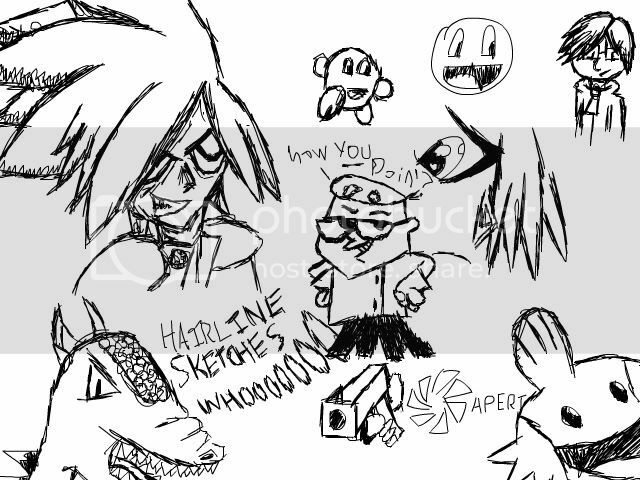 As you can see, these images clearly aren't merry, so no, this is not part of Merry Doodles and Sketches. Also, this thread is about my experimentation and evolution as I get better and better with art, flash, and my tablet. Plus, y'kno, the whole requests thing. If others can have them then I can too, no matter how much skill I lack. Also, she is NOT a whore. How could you say such a thing? You forgot to make it animated. I thought about it, but the clapping seemed out of place with the whole 'I say good sir' thing. I botched the shading on this one horribly. Hairline has it's place, but the texture just doesn't fit anything organic, I guess. I'll prolly just do the next few in solid colors to compare with. Gotta remember to copy my inking to a new layer before I start adding color though. I say good sir, I think you must have forgotten to actually do me. 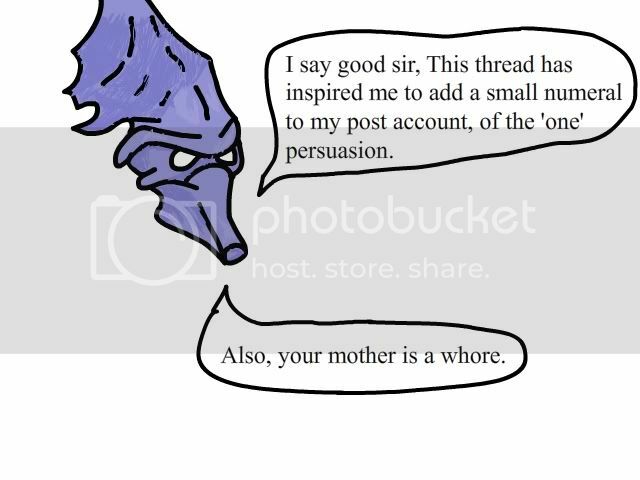 In fact my post fit with the template I have been given by the others: Make a tangentially related comment on your thread or your pictures while not adding anything meaningful to the topic at hand. 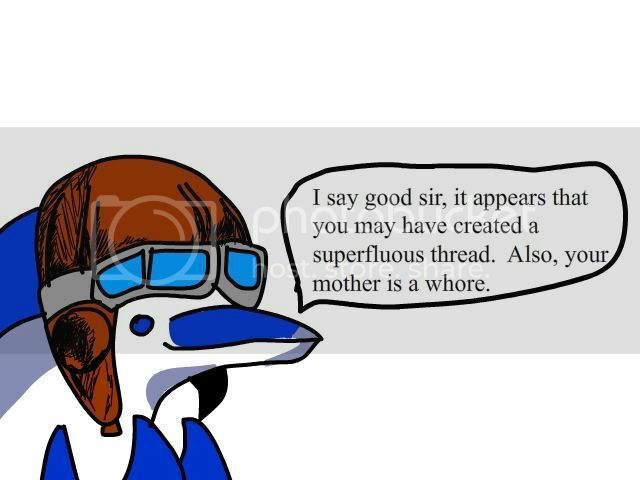 Also your mother is a whore. Okay, Flisch, first of all, I will not do you. Second of all, take a look at your avatar and then go ahead and wonder why I'm not going there. I mean, what the hell is that thing? 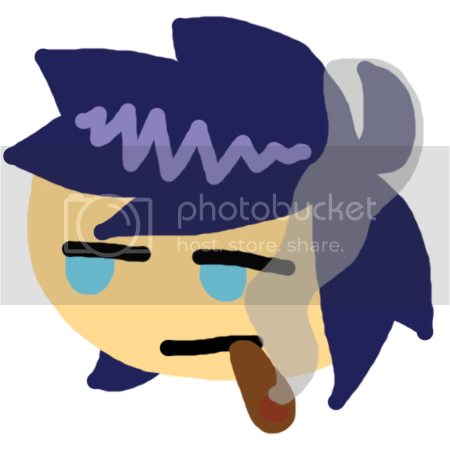 Now, the Mulldrifter, at least then I could make a vague Magic reference, unrecognizable as the final drawing would be, but that photoshopped monstrosity? Not a chance, mang. Also, you automatically lose points for calling my mother a whore. How could you. 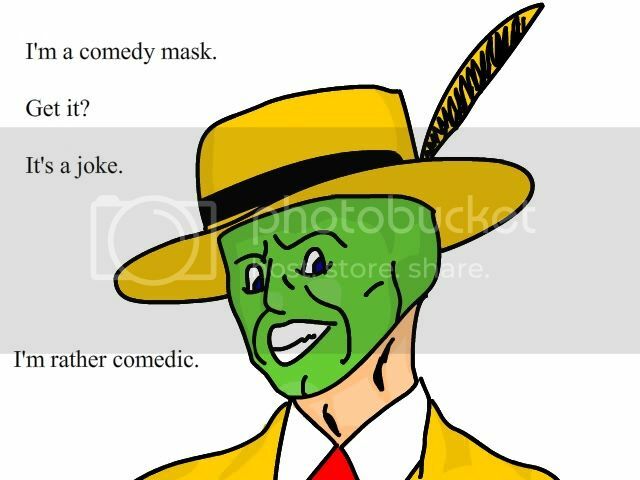 How about a fine possessive comedy mask? For some reason this reminds me of the Fonz. I liked this without any shading whatsoever, so I thought I'd upload it this way rather than screw with a good thing. 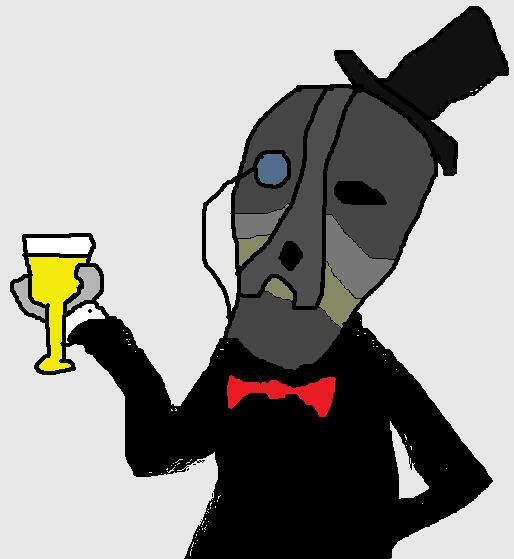 Also, when did this turn into the 'Come make DnD draw your avatar' thread? Thats because they're the same person. Oh wow, this thread made me laugh when I read it. If I wasn't saving over the image file every time I'd name this trollface.jpg. Will you still be embarrassing yourself far in the future, where your art is revered in godlike awe and has made you rich so your mother doesn't have to be a lady of the night anymore? Undoubtedly. But at least then I'll be doing it for money. 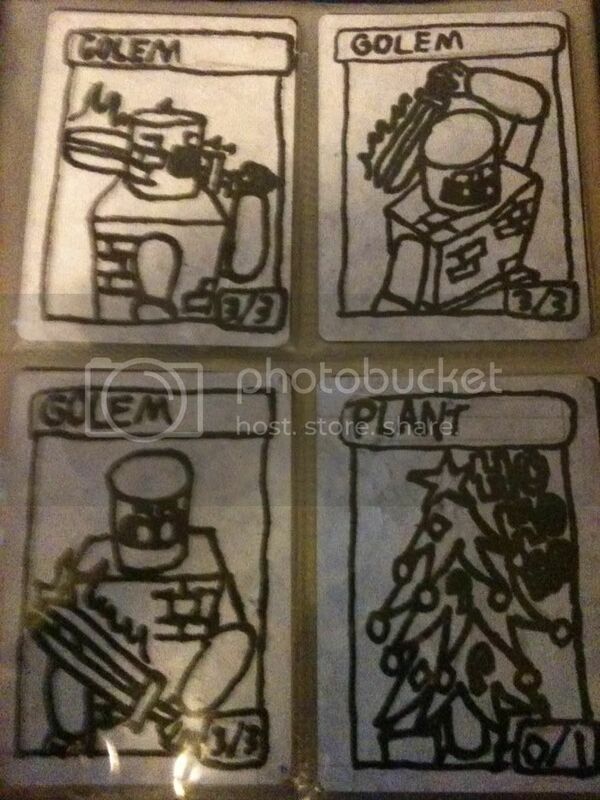 These were the first ones I did, based on actual token requirements in Magic (golems for U/W and Architect, plants for Valakut). Nothing really special about them. The christmas tree serves as a reference to 'magical christmas land' in which you have the best possible start and every aspect of luck in the game is working in your favor. 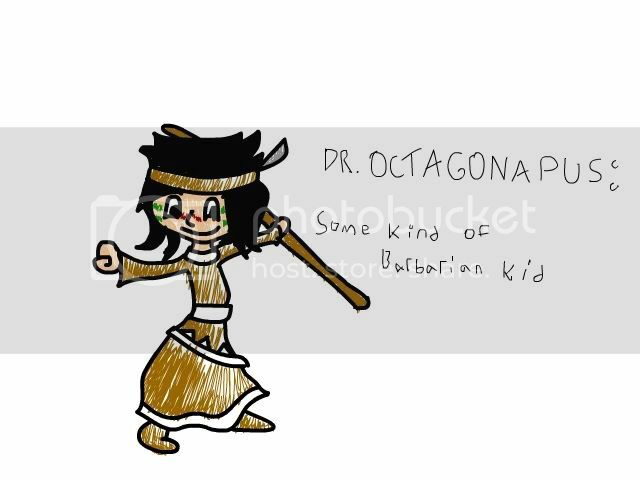 This is pretty much a whole page devoted to Dr. Octagonapus. Notice the stats in the box on the lower right in all of these. 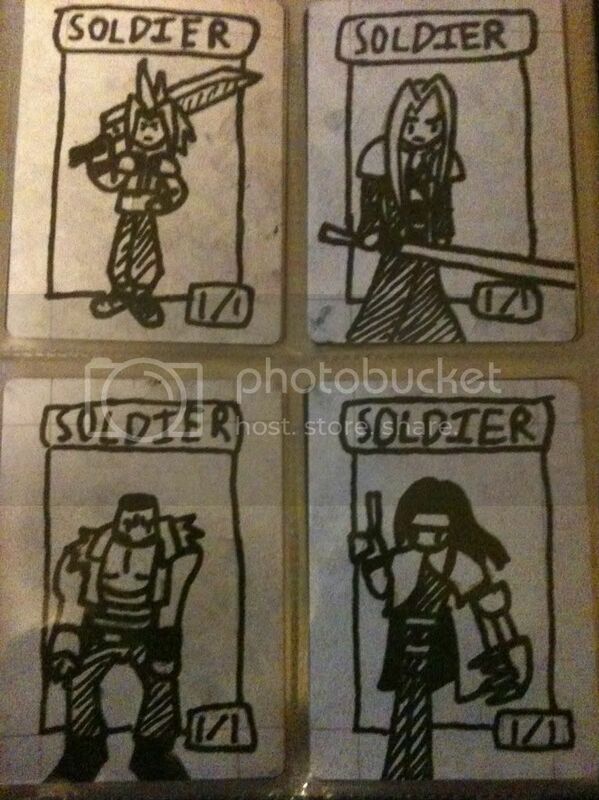 The four Soldier tokens in my possession are four members of the cast of FFVII, if they need any introduction. I know, I know, technically not all of them are from SOLDIER, but Soldier tokens are a recurring theme in Magic, so there you have it. Four of the planeswalkers, the main focus of the lore behind the game and some of the all star players. Three of them, Koth, Elspeth, and Venser, all have what are known as Emblem abilities, where you gain a lasting effect that stays until the end of the game even if the planeswalker dies. 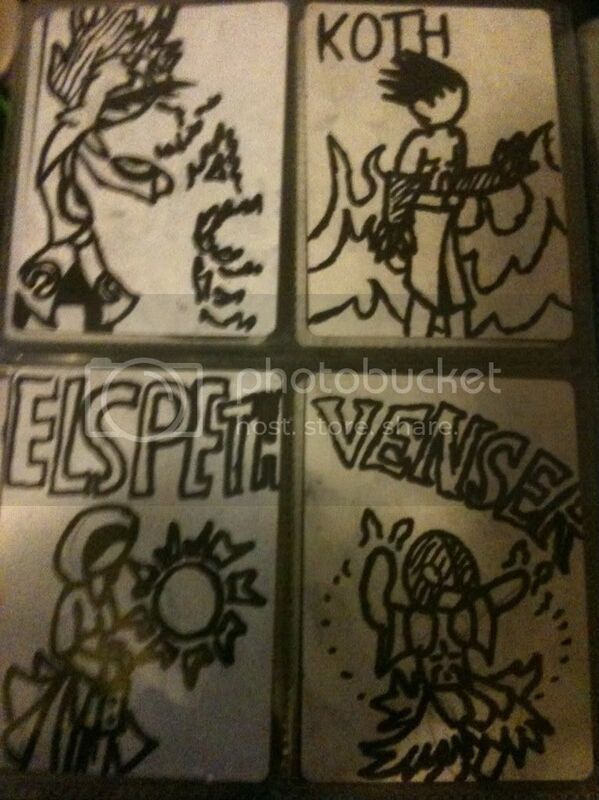 In effect, these are those emblems. 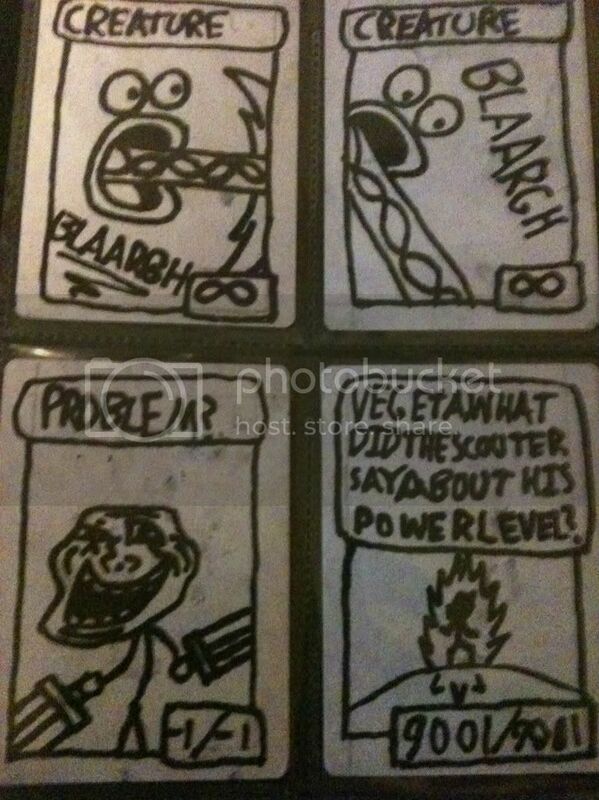 As for Jace, well, there's only three 'walkers with emblems in the game at this point. Jace is decidedly the most recognizable for players and has been the company's poster boy for a while now, so he takes the last slot. A whole page for me? How about drawing a weird angry voodoo mask in a bar? Oh wow, I had completely forgotten about this. I need to go install flash again and stuffs. how about: A raccoon in a swimming pool fighting with a mermaid on crack?